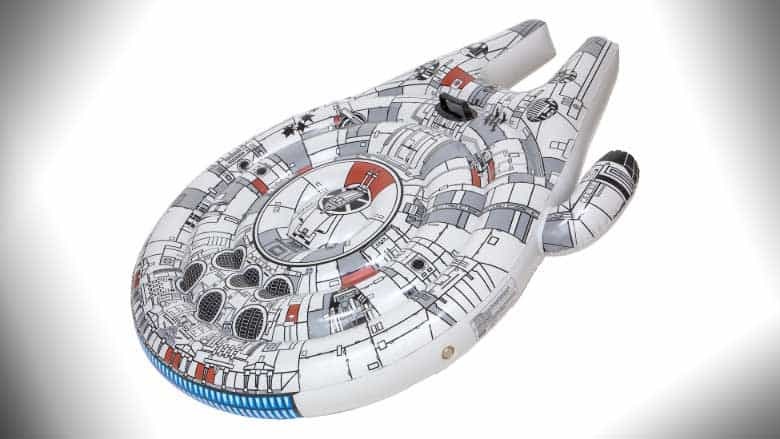 The Millennium Falcon Pool Float is Here! | Nerd Much? The Millennium Falcon Pool Float is Here! Star Wars fans, we have a ton to look forward to this month, and a lot of it has to do with the Millennium Falcon. Want to check out the ship yourself? You don’t have to go to a galaxy far, far, away. That’s right, climb into a life-size replica of the interior of Hans Solo’s ship. Using the same molds used in Solo: A Star Wars Story, this replica is the size of 3, 20-foot shipping containers. Complete with everything from the Dejarik table at Lando’s bar, to the controls in the cockpit, this ship is making scheduled stops across the country throughout the month of May. The Millennium Falcon pool float is here! Designed in the shape of the iconic ship itself, this float features colored detailing, and a handle for when things get turbulent. Made of imported materials and priced at $39.90, it is currently in stock, just in time for Summer. Maybe it can’t make the Kessel run in 12 parsecs, but it can certainly keep a lazy pace floating in a pool on a hot summer’s day, and that’s really all we need.